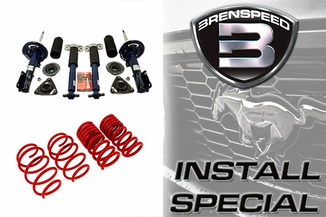 Brenspeed Install special that includes a 2015-2019 Shocks & Struts & Lowering Spring Package PLUS Professional Brenspeed Installation. Check out the huge savings!! Special available while supplies last. This custom Brenspeed Kit uses only top quality and performing parts to lower your Mustang and this kit has what you need to give your 15+ Stang that agressice lowered stance!!! This kit includes Eibach Drag/Lowering Front and Rear Springs to lower your Mustang approx 1 1/4 inch front, 1 1/2 inch rear to get your mass lower to the ground for better launchng and over all handleing. ALSO INCLUDED is a fantastic set of Ford Perfromance Track Rated Front and Rear Shocks and Struts. This is a HUGE improvement over the factory parts and will make a huge impact on the overall handling of the car on the street and on the track. Plus we include a pair of Caster/Camber Bolts for the front suspension to aid in alligning the car after lowering.